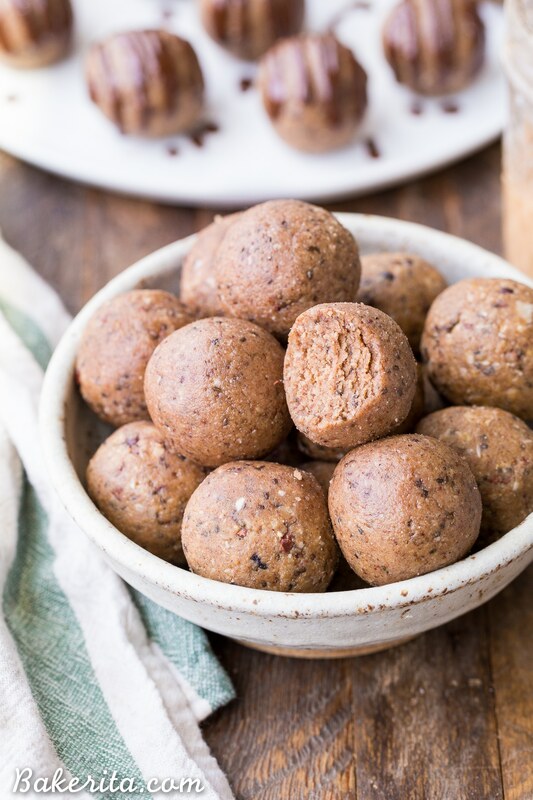 These Nutty Coconut Fat Bombs are an easy-to-make snack that is filling, full of healthy fats, and absolutely delicious! It’s a no-bake recipe that’s gluten-free, paleo, keto, low carb and vegan. First of all…WELCOME to my new site!!! If you’re new here, this isn’t applicable, but if you’re a returning Bakerita fan, you might notice a whole new site design! I’ve been wanting to get my site redesigned for YEARS now and I finally stopped procrastinating and contacted Heather from Viva La Violet to get my site redone. She did an amazing job translating my jumbled vision into reality and has been a dream to work with. Some of the most exciting changes are BIGGER photos, a way-easier-to-navigate recipe index, and a whole new homepage! There, you’ll see some featured seasonal recipes, popular recipe categories, and a feed of my new recipes at the bottom. I hope you love the design as much as I do! But because it is brand new…things may not be working 100% right away. Please let me know if you have trouble with anything on the site so I can get it fixed ASAP! Alright, now onto the balllllssss. This recipe came about when I was bored one night and just started throwing ingredients into my borrowed food processor. I wasn’t even really planning on posting it, but after I shared on my Instagram stories, tons of you wanted the recipe. Luckily, I vaguely remembered what I did, so I tested another batch to perfect things. And perfect, they were! Nutty, coconutty, flavored with cinnamon and vanilla, with a hint of crunch from the cacao nibs. Swoooon. Dang you guys, these are GOOD – so flavorful, filling, and nutritious. I had been wanting to make a keto-friendly, low-carb, paleo + vegan fat bomb for a while now, because I’ve been getting lots of requests for them (mostly from real-life family and friends). And though these came about unintentionally, these coconut fat balls totally do the trick. I don’t count calories or macros or anything like that, but I did calculate the macros for this recipe because I figured you all would probably be curious, especially if you do count your macros – you can find all the nutritional info listed below the recipe. These coconut fat bombs are, as you might have guessed, made with a whole bunch of healthy fats: nuts (I used walnuts the first time, and a mix of walnuts and pecans the second), coconut, coconut butter (I used my homemade toasted coconut butter), almond butter, and a bunch of seeds. They’re bursting with flavor too, from the cinnamon, vanilla, salt, cacao nibs, and optionally, a little bit of maple syrup. The maple syrup should obviously be skipped if you’re keeping these totally Keto or if you’re on Whole30. If you’re doing Keto and want them a little bit sweeter, you could try adding a teeeensy amount of stevia or monkfruit. If you’re on Whole30 and want some sweetness, 1 date would probably do the trick. Even without any sweetener though, these are still super flavorful and delicious. 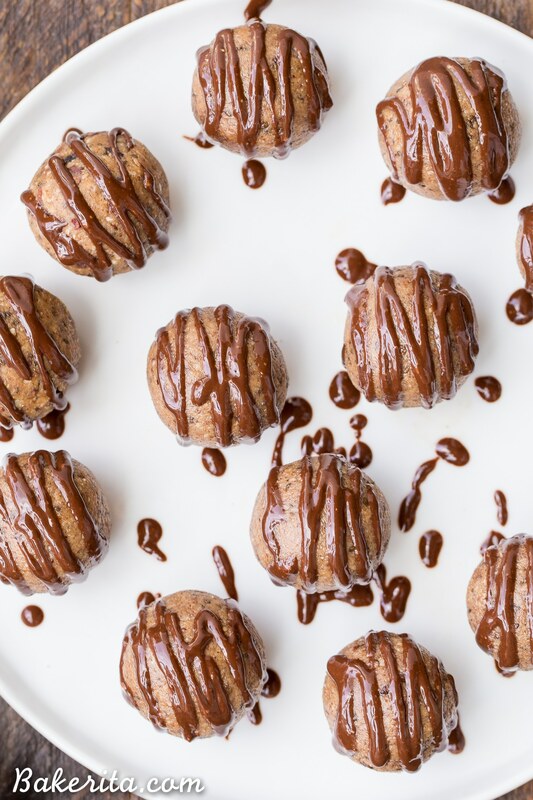 These Nutty Coconut Fat Bombs have a melt in your mouth texture, tons of flavor, and they’re suitable for just about every restrictive diet (except the ones where you can’t have nuts ). 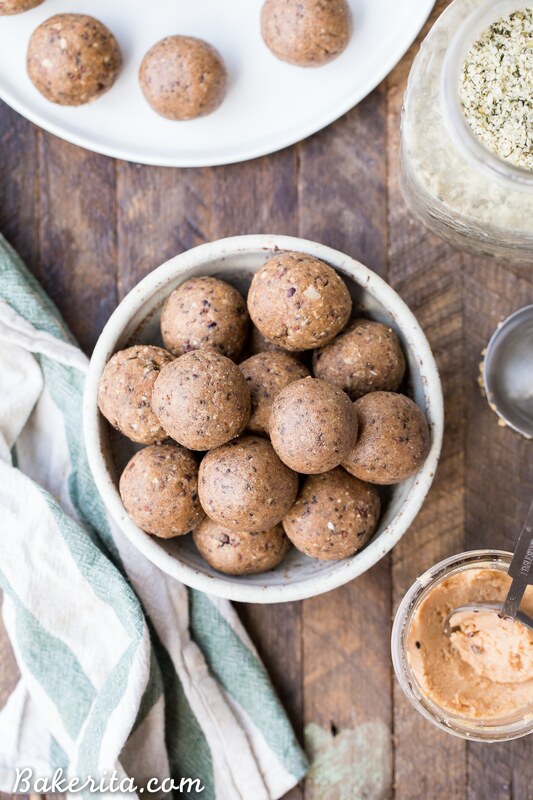 So come on, my paleo, keto, grain-free, gluten-free, dairy-free, vegan, and sugar-free friends…let’s make some balls! 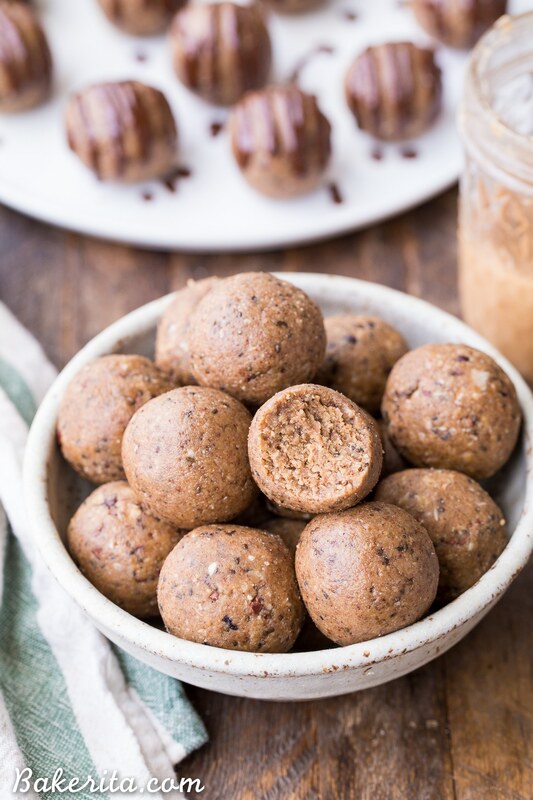 These Nutty Coconut Fat Bombs are an easy-to-make snack that's filling, full of healthy fats, and absolutely delicious! 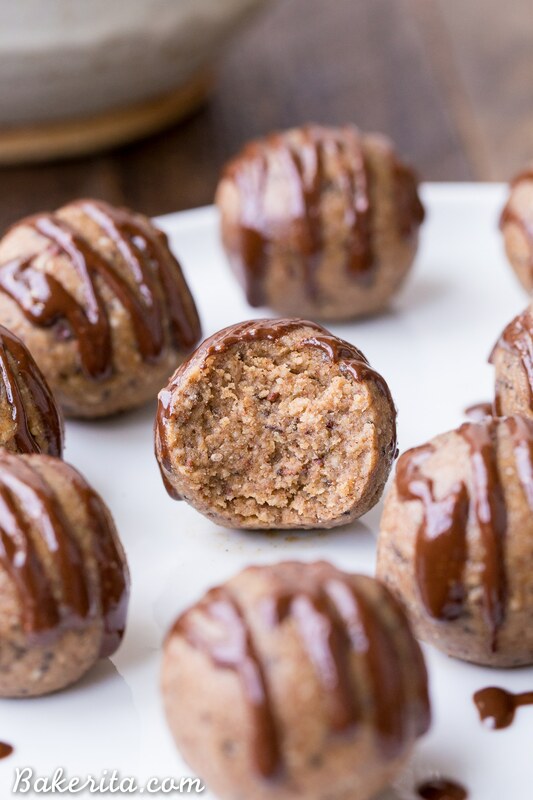 It's a no-bake recipe that's gluten-free, paleo, keto, low carb, Whole30-friendly, and vegan. Keep processing until the oils start to release a bit and the mixture sticks together easily - just be careful not to over process or you’ll have nut butter. If your mixture seems dry and if you're not using the maple syrup, you may need the extra tablespoon of coconut butter to help it come together. Once the mixture is sticking together well, pulse in the cacao nibs, just to incorporate them. Nutrition facts do not include chocolate drizzle or maple syrup. The new site is SOOOO BEAUTIFUL!!! So fresh and clean and airy! 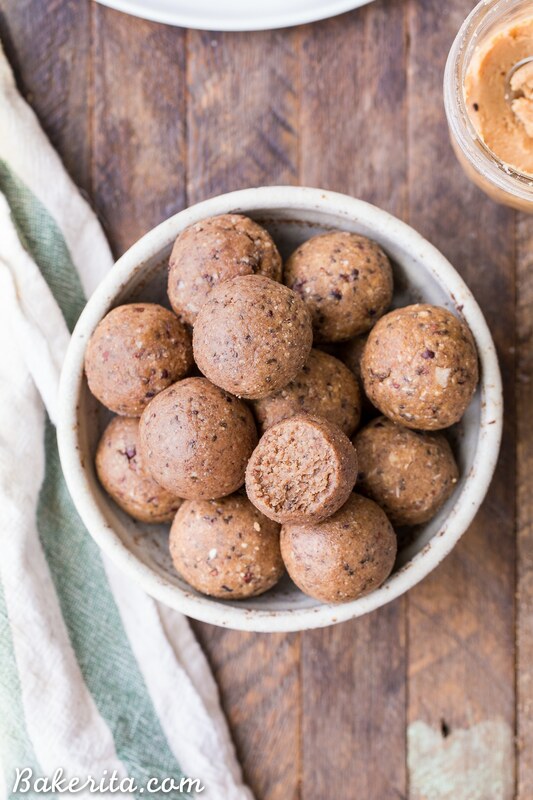 Also I’m totally pinning these fat bombs – they look like the perfect snack! Espeeeecially with a lil chocolate drizzle. Thanks so much Lucia!! So glad that you like the new site :) and I hope you love these balls! The question is why am I not eating these right now? Will definitely make in the next day or so. Love the new design. I hope you love them Bonnie! Thanks so much for your feedback, and I’m so thrilled to hear you like the new design too. Your site may be nice to look at, but I just can’t with all of the “keto,” “whole 30”, “paleo”, and “vegan” anymore. I have followed your site for a few years and used to love seeing true desserts, but as someone who is suffering from an eating disorder, your website is all about supposed “health” promotion. Reading about the “whole 30” etc., is not what I need in my life. Hi Amanda, I’m truly sorry you’re not enjoying my content anymore. I’ve personally changed the way I eat, and now avoid gluten, dairy, and refined sugars because it makes my body feel much better. I want to reflect the way that I eat on my site, and it wouldn’t be authentic to post desserts loaded with flour, sugar, and butter because I don’t enjoy eating them or the way they make me feel. I don’t follow any specific diet strictly, like a Whole30, but I like to mark my recipes as such so people who do follow those diets know which recipes they can enjoy. Thanks for your feedback. I have always thought you to be a beautiful, talented, gifted girl, Rachel. I wish you nothing but the best and I know full-well that you have thousands of fans–and rightly so. You do tremendous work and who am I to be criticizing you in any way? Continue to follow your dream and I will take my issues elsewhere. I am just so fed up with our sickening diet-culture that only seeks to drain women of their essence by making them follow the next trending diet. It is my personal view and I should not have shared my deep angst with you. Again, only my best to you and your creative mind. Thank you so much for your kind, thoughtful comment Amanda. I really appreciate it, and I do totally understand where you’re coming from. For me, it comes down to what kind of food makes me feel the best and helping other people to find foods that do the same for them. Wishing you lots of love and all the best, Amanda. Yeah, you know I’ll keep checking in :) It’s too good not to. So glad you enjoyed them!!! Sorry the chocolate drizzle ingredients didn’t show up – you’re totally right. I’ll fix that now! Thanks so much for your feedback. What kind of vanilla bean powder do you recommend? I buy it from Amazon, the brands Kiva and Wild Foods both make good ones! You want to find pure vanilla bean powder. Is it all right to substitute w vanilla extract for my first batch? Yes that should be just fine! Enjoy. How have I only just found your website! Its AMAZING! IM TOTALLY MAKING THESE TONIGHT!!!!! Thank you so much, Brittany! Hope you love them :) I’ll definitely keep your requests in mind! OMG Rachel, you have knocked it out of the park again!! These are absolutely incredible!! I didn’t have any coconut butter, so I followed your quick recipe to make toasted coconut butter and it came out PERFECT! As a side note, all I had was finely shredded unsweetened coconut and it worked perfectly to make the coconut butter. I have lost count of how many of your recipes I have made and every single one of them has been SO delicious, so easy and something I make over and over. I am obsessed with coconut and all things in this recipe but never would have thought to put everything together the way you did. Please keep doing things exactly as you are, because so many people benefit from what you are doing! Thanks again!! And also, this new site is beautiful and totally easy to navigate! Yay yay yay! Thank you so much for all your kind words, SK – you put such a big smile on my face. 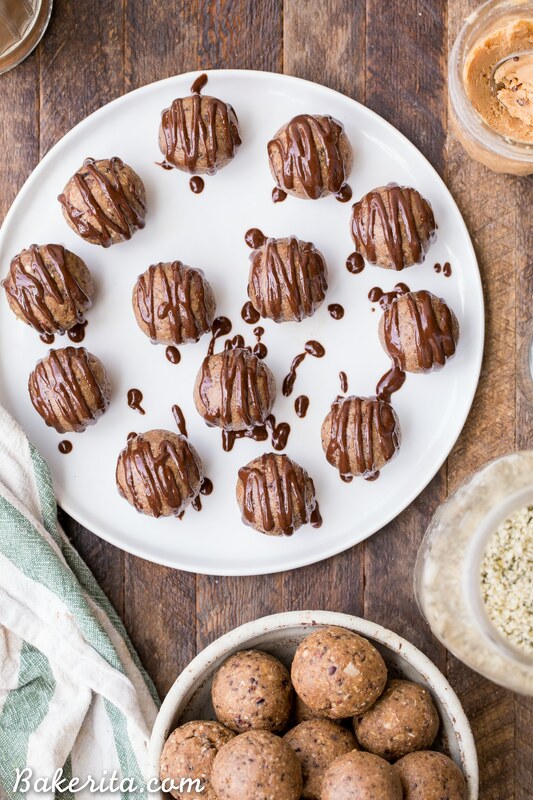 I’m so thrilled to hear the coconut butter and the fat bombs were easy-to-make and delicious :) I hope you continue to find many recipes you love! I’m so appreciative of your feedback. I’m so thrilled to hear that!! I hope all of the recipes are a hit at the potluck :) you’re so sweet to say that, and I’m so happy you appreciate and love my recipes. Nothing makes me happier than sharing them! What can I use for coconut butter substitution? Hi Cheryl, I haven’t tried it with anything else so I can’t make any guarantees, but it might work to use half coconut oil, and half almond butter in place of the coconut butter. I actually used coconut oil and more almond butter in place of the coconut butter, and it seems to have worked really well. They’re delicious!! Thanks for the helpful feedback Lindsey! Yum sounds like a delicious addition! So glad you’re loving it!! Hi! Are your nutritional calcs based on one level tablespoon per ball? Thanks! It’s based on getting 15 balls from the amount of dough! I used this cookie dough scoop to form the balls, which I think is about a tablespoon. Hope you enjoy them, Skye!